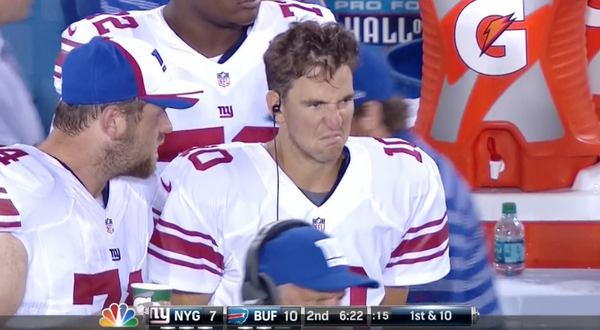 Eli Manning an elite quarterback? I’m not buying it. Throughout his career Manning has always flirted with the elite status bouncing from Super Bowl hero to an interception machine. Entering his eleventh season in the NFL it is safe to say that Eli Manning is not an elite quarterback. For the Giants fans who are most certainly screaming at the top of their lungs that this is blasphemy there are many reasons that Eli is not an elite quarterback. However, he is still a very good quarterback and probably a top ten quarterback in this league. This is why he is not an elite quarterback. Most critics would argue that the two Super Bowl rings that Manning has accumulated is proof that he is an elite quarterback. Well, not exactly. True it is one more ring then his brother Peyton, who is clearly the more talented of the two, but this is misleading. In 2011 there is no question that Eli carried that Giants team to the Super Bowl and played a superb game against the Patriots. Even in 2007 he did have a good postseason. The problem? The Giants defense carried them throughout those playoffs and in the Super Bowl. Let’s not forget that the Giants’ defense allowed only 14 points to a Patriots offense which, before this years Broncos, had scored the most points in a season. If the Giants didn’t beat the Patriots when the defense held Brady and company to 14 points you don’t think Eli would have been run out-of-town? Another reason why Eli is not elite is he is one of the streakiest quarterbacks I have ever seen. He’s either on or off, nowhere in between. Just look at his postseason career. In his two Super Bowl runs Manning threw 15 touchdowns to 2 interceptions. His other postseason starts have been disasters. Not only are the Giants one and down in those playoffs but Manning has only 2 touchdowns to 5 interceptions. When we think of elite quarterbacks they are consistent. We all know what to expect out of elite signal callers like Peyton Manning, Rodgers, Brees, and Brady ever season. Eli is either great or terrible. Last season was the third time in his career where he led the NFL in interceptions. Put it this way, Geno Smith threw less interceptions as a rookie with less talent around him then Eli Manning with a better team and who has played in the NFL over ten years. I’m sorry, but elite players don’t lead the league in mistakes three times. Manning still is a capable quarterback. He still is a great quarterback in the fourth quarter and two-minute drill. Also, when he is on he is one of the best in the game. Unfortunately for Manning, the Giants offense is rebuilding and he does;t have the pieces to be a contender. Unless Eli can finish his career strong and with some consistency, he will never be considered an elite NFL quarterback. Previous Tebow Comeback? Which NFL Team Should Take a Shot?